Work produced by the Drake SJMC public relations seniors in spring 2017 recently won a 2018 Clarion Award in the advertising or public relations campaign category of the national Association for Women in Communications contest. The 2017 PR senior capstone client was Des Moines’ Young Women’s Resource Center. The Vector Strategies team included 2017 SJMC graduates Ashley Hawkins, Sarah Mattes, Reed Fischer, Nick Frandsen, Megan Johns and Kristen Carver. 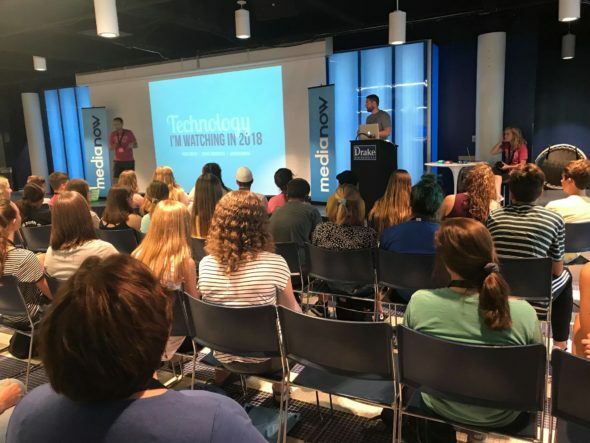 Drake SJMC this week is hosting almost 80 high school students and their advisers from around the country for a three-day intensive journalism boot camp. Media Now Drake students choose from tracks focused on design, yearbook, writing, video, web, sports reporting, photography and editorial leadership, taught by professionals and the best high school teachers. Participants are getting the full Drake student experience: staying in Jewett Residence Hall, eating in Hubbell Dining Hall and taking field trips around the Des Moines metro area. This is the third year of Media Now Drake, and many of the campers eventually join us as SJMC first-years!